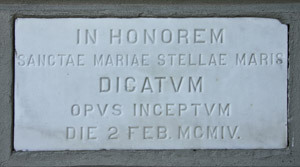 Construction of the present Saint Mary Star of the Sea Church began on February 2, 1904 as is indicated by the corner stone near the front doors of the Church. This new Church was needed because the original wooden Saint Mary Star of the Sea Church was destroyed by fire with evidence of arson on September 20, 1901. 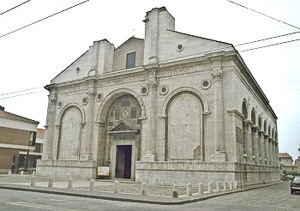 With wide community support from Catholics, Jews and Protestants, and people of goodwill, the construction was completed, the Church was dedicated, and the altar consecrated on August 20, 1905, by the Most Rev. W. J. Kenny, D.D., Bishop of Saint Augustine. The architect was Brother Cornelius Otten, S.J. Originally from Holland, Brother Otten was instrumental in the design and construction of many Churches served by the Jesuits of the New Orleans Province throughout the South East United States. 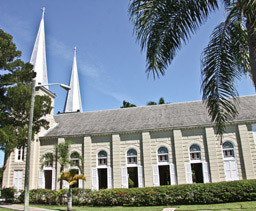 Saint Mary Star of the Sea Church was under the Province’s jurisdiction at that time. The furnishings, statuary and the Church building itself suffered from the ravages of time, climate and pestilence. However, due to much care over the past century in various restoration efforts, the Church has retained its inherent beauty. The present altar of sacrifice in the Church was consecrated and the present liturgical furnishings were blessed by Archbishop Edward McCarthy of Miami on December 17, 1992 upon completion of a major restoration under the supervision of an historic preservation architect. 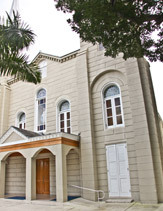 The Church’s exterior design represents the eclectic period of American Victorian Architecture and is reminiscent of a modified early renaissance revival building with rusticated exterior walls, round arches, and lunettes filled with transitional gothic arches, louvered shutters and colored glass windows. The stone blocks that went into its construction are in fact poured concrete made from the oolitic limestone dug from the ground on which the Church stands. 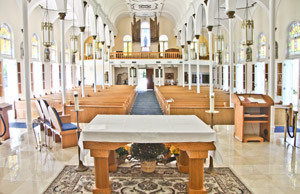 It became the first non-wooden place of Catholic worship in South Florida. The exterior architecture is similar to Leone Battista Alberti’s San Francesco Church in Rimini, Italy. Capped with a cross, each tower rises 29.57 meters (97 ft.) high. The towers’ bases are 3. 96 meters (13 ft. 8 in.) square with louvered shutters at the ground level. French windows with arches filled with decorative colored glass are at the mezzanine level and fixed louvers with a lunette decorated with gothic tracery are at the attic level of the towers. The towers are crowned with very steep pitched conical roofs covered with metal tile shingles. To the greater honor and glory of God, this bell is donated by Mr. & Mrs. J. A. Kelly, of Chicago to the Church of the Blessed Virgin Mary Immaculate Key West, Florida, Michael Joseph Curley being Bishop of the Diocese of St. Augustine Florida in the year 1918. Saint Mary Star of the Sea Church is rectangular in plan, 16.46 meters by 34. 75 meters (54 ft. by 114 ft.) and 13.41 meters (44 ft.) in height.The sanctuary and the sacristies are located at the south end of the Church with the main entrance at the north end, flanked by two side towers with spires. Particular care was taken to make the Church comfortable and cool in this sub-tropical climate. For this purpose, six of the nine exterior bays are defined by paired shutters and doors which measure 1.22 meters (4 ft.) wide by 2.99 meters (9 ft. 8 in.) with an arched colored glass windows rising to a full height of 5.03 meter (16 ft. 6 in.). Open doorways along east and west walls provide refreshing cross ventilation. Two comparison photos (above) of left interior height and archways and photo of Brunnelleschi’ Santo Spirito Church in Florence. These high and wide doorways were set along the east and west walls instead of windows to provide refreshing cross ventilation in the nave. In Key West, we have the ability to leave these doors open throughout the year due to the pleasant climate. Providentially, these open doors also provide more space for the faithful to gather during the busy winter and spring tourist seasons. The Church can seat five hundred comfortably, with its wide central nave measuring 14. 97 meters by 19.42 meters (49 ft. 10.5 in. by 63 ft. 7 in.). The two side aisles provide space for two hundred to stand within the Church. The open, high, wide doorways allow for another two hundred of the faithful to assemble on the surrounding sidewalks totaling nine hundred participants. Under the entrance portico, are the striking front doors of Dade County Pine (a native hard wood which is termite resistant and now virtually extinct.) The doors measure: 2.68 meters (8 ft. 8 in.) in height by 1.56 meters (5 ft. 11 in.) in width. The portico with the narthex serves as a gathering area as people arrive for liturgical celebrations. The narthex has two marble holy water fonts and is adorned with an inlayed mosaic of terrazzo with the symbols of the chi-rho cross flanked by the alpha and omega. The choir loft is elevated 3.6 meters (11 ft. 8 in.) above the narthex and extends from the front of the Church into the nave 5.85 meters (19 ft. 2 in.). It holds an organ and a piano and has the capacity to gather our three choirs for major liturgical celebrations. The interior of the Church inspires one with its clarity and height and represents the eclectic period of American Victorian Architecture. 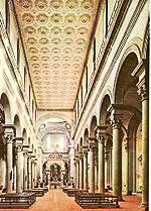 Many elements of the interior have both Romanesque and early Renaissance characteristics reminiscent of Filippo Brunelleschi’s Santo Spirito Church in Florence. The nave ceiling is a simple flat barrel vault decorated with rare pressed metal panels. The ceiling rises 9.54 meters (31 ft. 3 in.) above the terrazzo floor. The ceiling is supported on an arcade of round headed arches and tall thin cast iron columns with Romanesque capitals. Most of the interior walls and ceilings of the nave and side aisles are painted in off- white and white with the central nave measuring 14. 97 meters by 19.42 meters (49 ft 10.5 in. by 63 ft. 7 in.). Very selective decorative elements are gilded, which emphasizes the height of the columns and ceilings. The natural light playing through the colored glass arches on both sides of the nave add special significance to the stained glass window over the altar. Though there are devotional statues and images throughout the Church, and nature blazes with glory through the open doors, the clarity of the lighting and integrity of the furnishing compels the pilgrim’s eye to move forward to the altar of sacrifice, then, up to the stained glass image of Stella Maris and finally, up to the heavens in transcendence. The sanctuary measures 10.1 meters (33 ft. 3 in.) long by 7.38 meters (24 ft. 2 in.) wide and is elevated .49 meters (1 ft. 6 in.) above the floor of the nave. The Tabernacle of carrera marble with an inlaid decorative mosaic in the cap is from the 1949 restoration of the Church. It measures .34 meters (1 ft. 10 in.) deep by .34 meters (1 ft. 10 in.) wide by .98 meters (3 ft. 2 in.) in height. The front brass tabernacle door depicts in relief the Annunciation of the Archangel Gabriel to the Blessed Virgin Mary with the presence of the Holy Spirit and the inscription: Et verbvm caro factvm est. The tabernacle is securely fixed on a marble altar of repose consisting of seven types of marble. (This altar served as the altar of sacrifice until the sanctuary was distinguished by a separate altar of sacrifice encouraged by the Church Fathers during the Second Vatican Council.) Below the tabernacle on the altar of repose is a marble and gold leaf mosaic of the chi-rho cross flanked by the alpha and omega which echoes the design in the terrazzo floor of the narthex of the Church. The four marble columns and their capitals on the front ends of this altar repeat the Romanesque style of the columns and capitals originally constructed in the nave of the Church. The altar of repose visually frames the altar of sacrifice. This gives evidence that the restorations considered the integrity of style to facilitate the central focus of the Church: the Eucharist. The altar of sacrifice measuring 1.83 meters (6 ft.) long by 1.22 meters (4 ft.) wide by 1.1 meters (3 ft. 3 in.) high and made of red oak is located in the direct center of the sanctuary. Though not fixed, the altar is never moved. The ambo, measuring 0.67 meters (2 ft. 2 in.) deep by 0.91 meters (3 ft.) wide and 1.22 meters (4 ft.) high, is made of red oak with a marble front. The ambo is located in the front left section of the sanctuary. On the opposite side of the ambo in the sanctuary is the celebrant’s chair measuring 0.73 meters (2 ft. 4 in.) wide, by 0.34 meter (1 ft. 10 in) deep and 1.1 meters (3 ft. 5 in.) 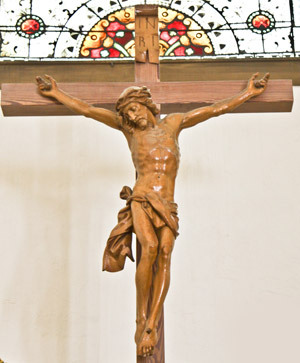 in height and is made of the same wood as the altar and ambo. The chair repeats the semi-circular arch within the Church. The celebrant’s chair is centered between two chairs smaller in stature for the deacon and another. The processional cross is placed behind these chairs when stationary. Along both sides of the sanctuary are four similar smaller deacon chairs for the liturgical ministers. The sanctuary is decorated with six medallion frescos. On either side of the stained glass window are the symbols for Saint Peter and for Saint Paul upon the sky blue accent wall. On the side walls of the sanctuary, placed under each archway, are the four symbols for the four evangelists. 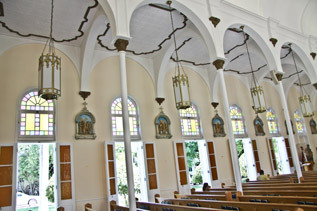 The filigree tabernacle lamp holder is suspended and extended from the right side of the sanctuary. At the end of the side aisles are devotional altars, which flank the main sanctuary. The baptismal font is located in front of the eastern side altar, which is made of red oak and measures 0.91 meters ( 3 ft.) by 0.91 meters (3 ft.) by 1.1 meters ( 3 ft. 3 inches.) in height. This location allows for the Sacrament of Baptisms during Masses. The paschal candle in the red oak stand is adjacent to the font. In the archway above the baptismal font is a medallion fresco of the Holy Spirit. A lectern for the cantor and announcements is located in front of the western side altar. There is a penitential chapel entered from the right and back of the nave. It contains a crucifix in eye view for the penitent sitting face to face with the confessor or kneeling behind a screen. There are other locations for the Sacrament of Penance. A room for families with small children for Masses (customary in the United States) also serves as the confessional during scheduled times for the Sacrament of Penance. It is entered from the narthex. As our climate lends itself to being outdoors, three large umbrellas are placed in front of the Grotto of Our Lady of Lourdes to the western side of the Church on special occasions such as the Feast of Divine Mercy or during penitential services. Under these umbrellas are chairs for the confessor and the penitent to enter into the Sacrament of Penance. The umbrellas at once protect from the tropical sun and indicates a place of prayer. The stained glass window in the sanctuary of Saint Mary Star of the Sea is compelling because of its beauty, its composition, its colors, and its placement in the southern end of the Church where the sunlight illumines it from dawn to dusk. The Franz Mayer Company in Munich Germany, with offices in New York, was contracted to create the stained glass window of the Patroness. Known for their beautiful work, this German company had no experience with the effects of salt air on the lead and the staining of the glass to survive fading as a result of the tropical sun in the southern exposure. Brother Cornelius Otten, S.J. worked in collaboration with the New York office to assure a beautiful and enduring image. The installation of the 3.9 meters (12 ft. 8 in.) high by 1.83 meters (6 ft.) wide stained glass window was celebrated in a city-wide event for the residents who nicknamed the Church, “the Cathedral,” because of the spires, the architecture and the window. Bishop Kenny of Saint Augustine returned for a second ceremony on the Feast of the Immaculate Conception in 1907 to bless the window and to ‘reaffirm’ the first dedication on August 20, 1905. Suspended above the tabernacle and below the stained glass is a carved wooden crucifix added during the 1949 restoration. Of unknown origin, the corpus is masterfully carved. The cross measures 1.65 meters (5 ft. 4 in.) by 1.04 meters (3 ft. 4 in.) in width. Though most of the statues have been replaced through the various restorations beginning in the 1940s, the current statuary carefully reflects the devotional faith of the people. One elder parishioner explained that for him the statues surrounding the baptismal font– the Sacred Heart of Jesus, the crowned Our Lady of Mt. Carmel with the infant Jesus and the Infant of Prague– are about God’s love. The statues on the other side–Saint Joseph, Saint Anthony and the crowned Our Lady of Charity, the patroness of Cuba– are about those who loved as God commanded. The individual offering of the statues indicate the vitality of the devotional faith of the people. An example is the Infant of Prague. During World War II, there was great devotion to this image among mothers of soldiers deployed in the war. One such mother, Mrs. Orsolina Toppino, had three sons deployed in combat simultaneously. In her anxiety and motherly concern, she invoked the help of the Infant of Prague. 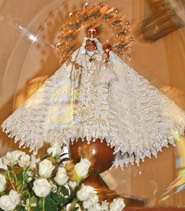 Upon their safe return to their home, she offered the image of the Infant of Prague to the Church in gratitude and for the benefit of all who invoke His help. In front of both side altars are prayer intention books in which parishioners and pilgrims write their intentions or sign their names. The one prayer intention book on the side with the Infant of Prague is often filled with the intentions from and about active military personnel and their families. Along the side nave walls are the original 1905 Stations of the Cross sculpted in plaster relief. On the rear nave walls flanking the narthex are images of two saints popular in American devotional life: Saint Jude and Saint Francis of Assisi. In 2003, two images were placed on the rear nave walls near the exit to the narthex: an icon of Our Lady of Czestochowa and one of Our Lady of Guadalupe which represents and consoles two groups of recent migrants to Key West. The former is of great devotional interest to the many Polish and other Eastern European faithful, and the latter is a devotional fixture in the spiritual lives of our many Mexican and Guatemalan parishioners. The beautiful statue of Our Lady of Grace arrived during the 1949 restoration. It originally was placed in the sanctuary above the tabernacle where the crucifix is now suspended. This beloved statue is now located in the front large window of the choir loft above the portico and between the two towers. It welcomes the faithful to their Church. In the evening, this image is illuminated as are the towers. Often, many visitors stop to photograph this image and pray before it. The Immaculate Conception is the patroness of the United States and the patroness of Nicaragua from which additional parishioners have migrated.